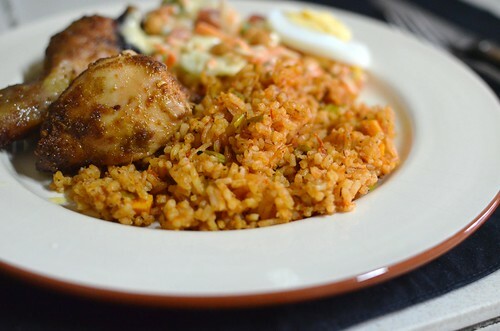 Here's an update on a Nigerian classic: Stir-fried Jollof rice. And this isn't to buck tradition - this is about how travel shapes who we are, opens up our eyes to new possibilities and redefines our boundaries. 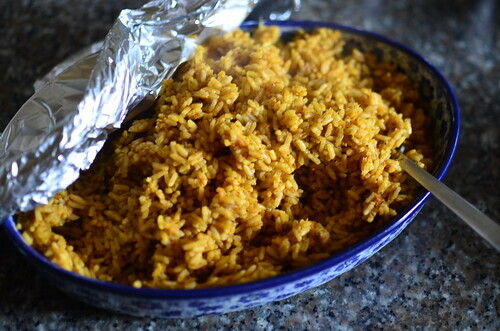 For Nigerian Jollof is typically 'stewed', not stir-fried or oven-baked. Right now, Nigerians the world over are planning their Christmas meals, and clothes. They are wondering how they'll spice the fried chicken, and how the Jollof (rice) must have that 'smoky' flavour, thanks to socarrat, or bottom pot as we call it in Nigeria. They have also picked out special clothes and shoes for the day. The children especially. Jollof rice is made for everyday, but especially for Christmas Day. Along with Fried chicken and beef and 'Nigerian salad' - a coleslaw type salad. It frees up the stovetop - I can cook and do more. It doesn't require 'mothering' of the pot - you mix the ingredients in, set it in the oven and let bake away. Step 2 is easy because the rice cooks at an even temperature so there aren't any issues (except of course your oven has hot spots).